Today is Small Business Saturday. Each year we celebrate small businesses and their contribution to our communities by having a special day to promote and support these businesses. They are the ones that show up at meetings and fight to keep communities clean, safe and a fun place to shop and live. The money made by independent businesses is generally spent in the community. And, a lot small businesses will be offering special deals and little extras too making today a winner for all. So let’s get out there and shop our local independent businesses and support our people, our neighbors and our community. Each year on Thanksgiving my family take turns naming something they are thankful for this year. Most of the time the answers are pretty generic. My spouse, my kids, or my health. Those are all great things to be thankful for but this year I’m digging deeper. I’ve been determined to find unique things I’m thankful for each day. So, every day while drinking my morning cup of tea I take a look at the day before and try to find something new to be thankful for. This could be someone new that I’ve met, an owl I heard hooting the night before or just an old song I heard on the radio. Whatever it is I was there, living in the now and noticing everything around me in a new and almost childlike way. Wow! So, what am I thankful for this year. I’m thankful that I’ve learned to live in the now and, no matter how much I am in a rush, I notice the small things. The things that make me smile, give me that warm fuzzy feeling, or…..help me to notice that someone around me needs a quick hand. A hot cup of coffee or simply picking up something they have dropped. And, in return I’ve received help several times when I’ve dropped something or just needed a hug and magically a friend or relative suddenly appears. I’m thankful for daily blessings. How about you? 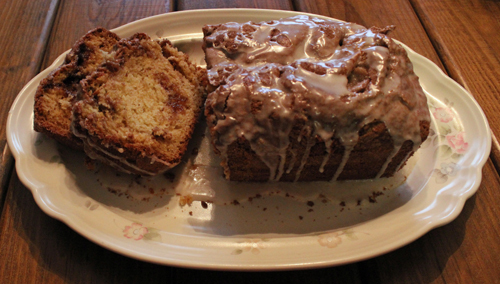 Banana bread with a cinnamon twist. This one was a big hit with my family. Preheat the oven to 350. Spray or grease a 9 x 5 loaf pan. Blend the bananas, butter, sugar, egg and vanilla until well blended. You will probably have some small banana chunks and that’s ok. Add the baking soda and salt and flour. Put half of the mixture into the loaf pan. Mix the cinnamon and sugar together and sprinkle over the mixture in the loaf pan reserving a tablespoon or so for the top. Put the remaining mixture over the cinnamon sugar in the loaf pan and sprinkle the left over sugar cinnamon on top. Bake for about 60 minutes or until a toothpick inserted in to the middle comes out clean. Let cool an remove from pan.